Turn your favourite rainy day sandwich into a pocket of deliciousness when you make these Grilled Cheese 'Ravioli.' Trim the crusts off slices of white bread, then fill them with cheese and create your very own 'ravioli.' 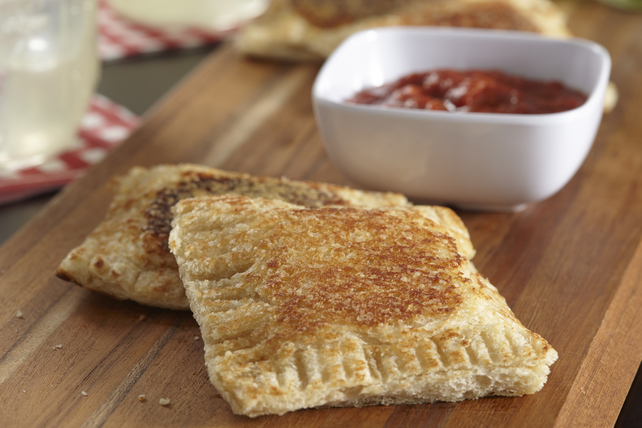 This Grilled Cheese 'Ravioli' is perfect for dipping into pizza sauce. Cut each cheese slice into 4 pieces; place in 4 stacks of 4 cheese pieces each. Spoon 1 tsp. pizza sauce onto centre of each of 4 bread slices; top each with 1 cheese stack. Brush cheese-topped bread slices with water, being careful to not brush water onto cheese. Cover with remaining bread slices to make 4 sandwiches. Press edges of sandwiches together with fork to seal. Mix Parmesan and oil until blended; brush evenly onto outsides of sandwiches. Cook in large nonstick skillet on medium heat 3 min. on each side or until cheese is melted and sandwiches are golden brown on both sides. Serve with remaining pizza sauce. Prepare using your favourite variety of Cracker Barrel Cheese Slices.